I'm really busy lately with the jobs and everything else, so I don't have as much time to make cute lunches for the boys anymore. Often, it's just sandwiches and fruit and chips or something simple like that. Once in a while, I see a really awesome lunch idea and take a few extra minutes from my day to incorporate it into the boys' lunch. I do this for one reason: I love my boys, and I want to make their day a little more special. Which is why I'm frustrated by all the snippy blog posts lately about bento lunches. Moms ragging on other moms for their lunch efforts. Saying that they're creating these lunches just so they can out-do other moms and be "supermoms". It's hateful, it's judgmental, and it's just plain snarky. I don't know why these moms are so angered when other moms make their child a cute lunch. First of all, I don't see why it is their business what another mom packs her kid for lunch. And secondly, don't you think it's probably a very rare instance that a mom would be motivated to go through all that trouble just to try to put another mom to shame? Please. The other day, I packed the boys some Teenage Mutant Ninja Turtles from apples and cheese (which I saw on a Facebook post). A friend who works in the school cafeteria was really sweet and texted me this picture. It made me feel so happy - to see my boys' smiling in the middle of the day, and to know that I'd brought them a little extra joy during lunchtime. Being a mom is hard enough. What moms don't need is criticism and hatred from other moms over their hard work in raising their children. Try supporting each other instead. It would make the life of that mom a lot happier. I don't remember doing much like that for our daughter but I would have if I knew how to do it. I did slip odd things into her lunch bag such as a potato, just to give her a laugh at lunch. We started her to packing her own lunch at an early age. heerlijk om zo van de eenvoud te genieten. I'm a bit flabbergasted. I would not have thought anybody would care what anyone else's kids brought to lunch, as long as the children had enough to eat. I think this must be a woman thing. Don't let it bother you, you have to do right for your own sons and that's entirely your own business. This astounds me, too, that people would pick on others who are doing something sweet for their kids. I guess some people let their own lack of confidence cause them to put down others. I bet your boys love the little surprises that they find in their lunches, and that's all that matters. How can anyone argue against those smiles? I never saw a Turtle apple, but will make some this week for the grandkids. I got another milk goat this week and named her Polka Dot. LOVE that she sent you a photo! adorable! Yikes! Truly pathetic.... Some of these people need to get a life. YIPES---I'm sorry to hear this. Seems as if these days, not just "moms" but many people are SNIPPY, RUDE, and JUDGMENTAL toward each other. Wonder what happened to us all just enjoying each other and all of our marvelous differences?????? We are all unique and special. Just think how boring this world would be if we were all alike. Keep being the best Mom you can be --and delete those snarky Moms from your lists. The turtles are adorable and I will file this for later.Think little girls may like it? Lisa, I had no IDEA this is going on. And it is awful and hateful!!! Moms need to support and care for each other. And I have always said you are a super mom! These women must feel very insecure, or they are having a permanent period. Each mom does the best she can and is different from others. Comparisons always cause nothing but trouble. The turtles are super cute! I don't get why people are so snarky. That is so much fun. I love the idea of it. I bet the kids love eating them. Amen, sister. I just made two cousins angry with me over the same topic. It's hard enough to be parents these days--why judge another parent? I had to spout off on that the other day on my blog too. As for the lunches---anything you can do to get them to eat a packed lunch each day is fair game. And now you have the "lunch police" at schools checking the kids' lunches so they are healthy--it's nuts! I'm just wondering how parents know what other parents are packing???? That is some weird competition, right? Criminy. Those ninja turtle apples are pretty cute. I may have to try that. Not to out due yours, but just because my boys love the turtles. Usually if I do anything artsy with food, it's at home. Then I have a plate to spread it out on. I don't like having to shove really cool fun things into a box, or bag. Those are cute! I'm afraid a lot of people let the internet bring out their frustrations. Kind of like driving in traffic! 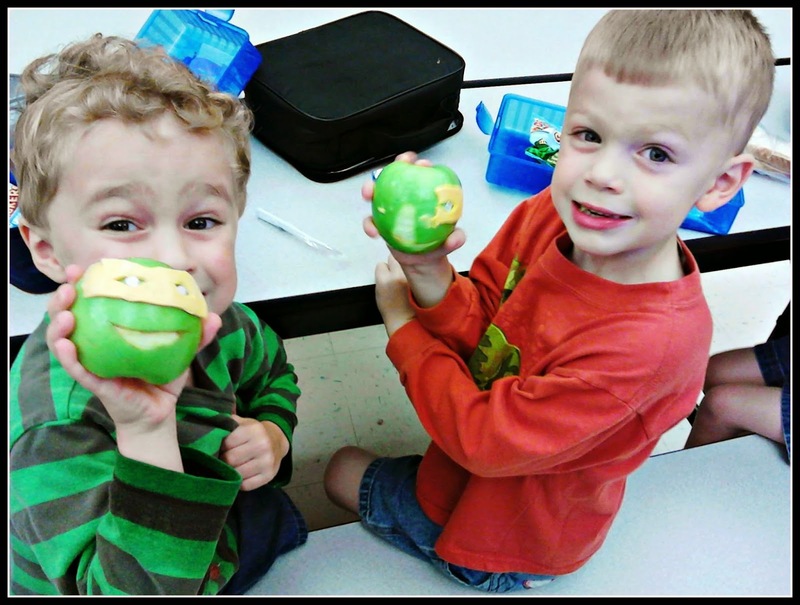 The ninja apples are the cutest thing ever; what a treat to see them smile while at school! There was just a great article about local Dad's who started painting their kids lunch bags. Very inspiring. i think the bento lunches are pretty neat...even for adults and older kids, not doing the cutesy things but the idea is fun and creative. love the way your appless turned out and if mine were still little i would have loved to do fun stuff like that from time to time. such a cute photo and how sweet of your friend to send you the pic! ps. i was looking for you at farm days! Lisa you are truly admirable! I love reading your rational posts. Good job on speaking your words! We agree with you!!! Too much hatred!!! We love that photo,, its adorable and those smiles- no money could buy them. Unbelievable what some people find to harp on. Your intentions are genuine and loving. Ignore the haters. Everything is always a competition to some people. I think if someone has a problem with it they really only have a problem with themselves. Keep doing what you are doing because it's all about the boys!!!! the pumpkin recipe looks so good... for some reason we cannot leave you a comment. Oh my goodness... I LOVE this lunch idea!! I think its wonderful that moms take the time to create special lunches for their kids. It's just another way for their children to remember throughout the day how much they're loved. I personally don't have a creative bone in my body, but when my son starts reading a little better, I will start leaving him little inspirational messages to remind him how special he is... Maybe I'll even try pulling off your Ninja Apples...Turtles.